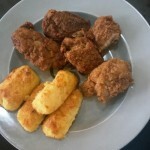 If you are craving a certain fast food chain’s southern fried chicken, then sometimes you just gotta have it. 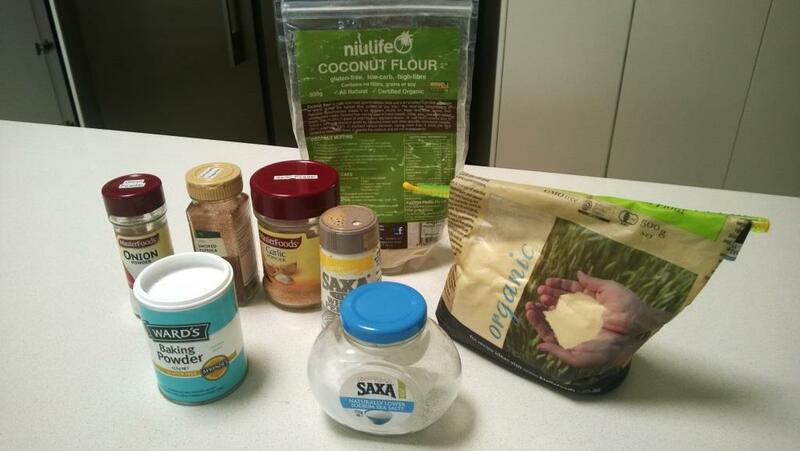 This version is low carb and absolutely yum – can’t believe this is actually good for me ! Fried Chicken Cravings? We have an Easy Lo-Carb option for that! This one pictured is served with my Caulitots – basically tater tots made out of cauliflower – recipe to follow shortly. You will need a little time with this one as the chicken is soaked for at least two hours first so make sure you plan ahead with this. 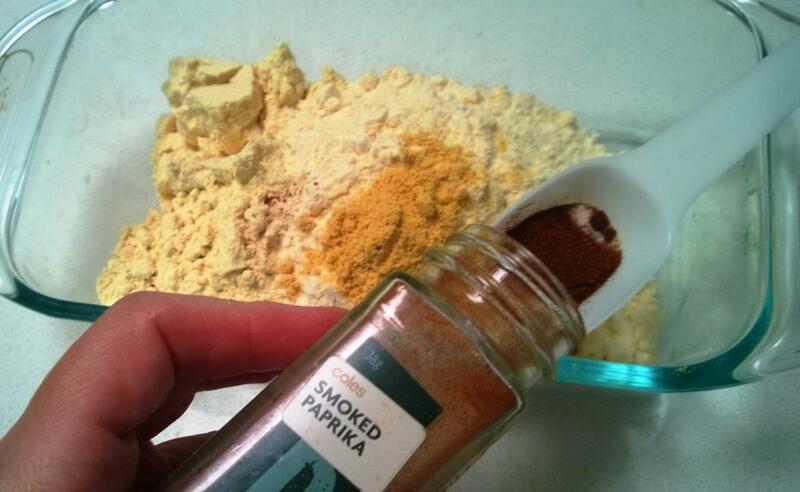 You should also play around with the spice mix, use your favourite spices – if you like things spicy add some Cayenne pepper, if you like more garlic add a larger amount of garlic powder… my mouth waters just thinking about it. 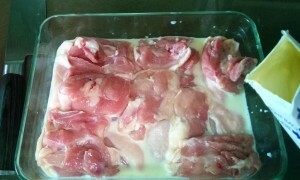 First you need to marinate your chicken in either buttermilk, full cream milk or cream. I used half cream half milk not much is actually going to make it into your meal, its just going to relax the fibres in the meat which makes it easier to eat – more melt in your mouth. I used boneless thigh fillets with their skin on, I had to order this specially from my butcher as most places only sell the bone in version with the skin here. You of course can use what ever cut you like, I just find it is easier to cook and eat without the bone. Also I have the worlds smallest deep fryer and so don’t have room for bigger pieces. 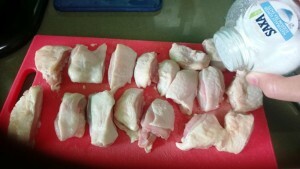 So cut your chicken into the size you want – the larger the piece the longer it will take to cook – make them bite size and you have popcorn chicken – I cut each thigh into thirds. Salt the outside and rub the salt into the chicken. 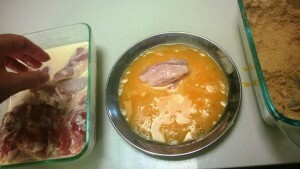 Then place the chicken in a bowl and add enough milk, cream or buttermilk – or combination of these – to cover the meat. You need to leave this in the fridge for at least two hours but as long as 12 hours. While this is marinating, make the coating. I used 1/2 cup of coconut flour and 1/2 a cup of soy flour, I find a combination keeps the strong flavours of each at bay. Go easy one the ones you are not so keen on and add extra for the ones you love. 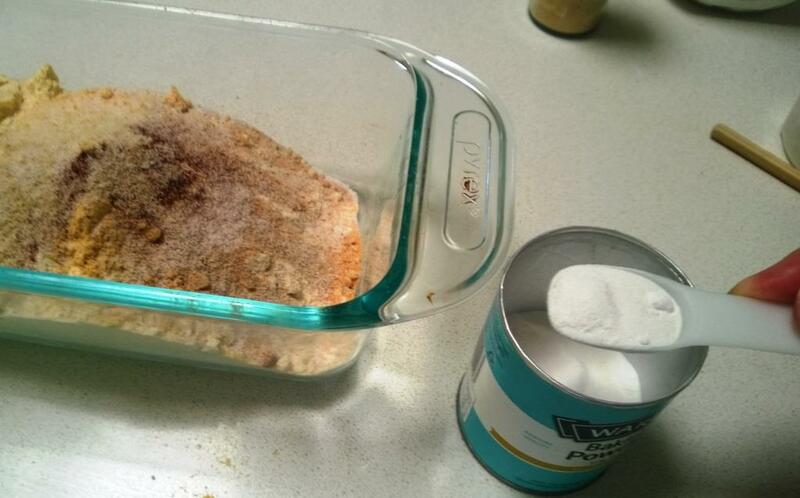 Add the salt, pepper, baking powder and splenda/sweetener. 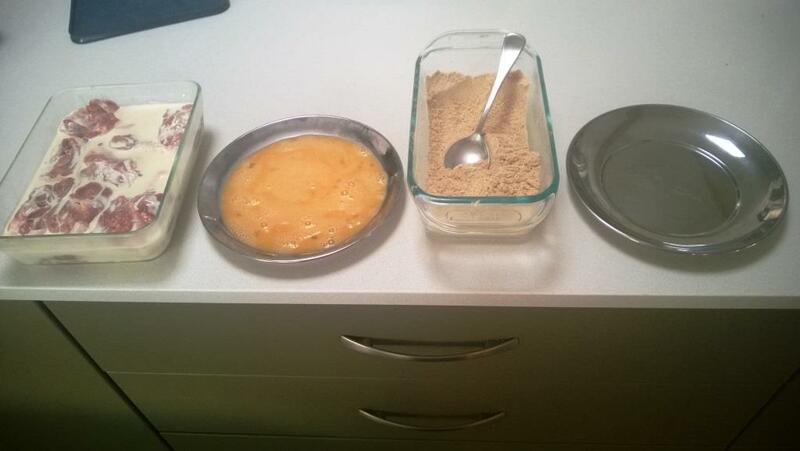 Mix the flour and spices until the colour is consistent and it is well combined. Next line up the chicken in buttermilk, egg, coating and then a clean plate or shallow dish. 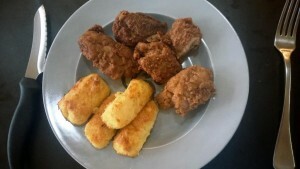 Working from left to right work with enough chicken for a frying batch, never over fill your fryer whether it be a deep fryer or a saucepan on the stove top. Too much in a batch will decrease the temperature too much and could make the meat dry out before the outside is properly sealed and the oil can get close to the top and boil over or splatter. Start by taking the chicken and letting it drain excess buttermilk for a second or two, then place it into the whisked egg. Then put into the flour/spice mixture and ensure a good complete covering of the fried chicken piece. 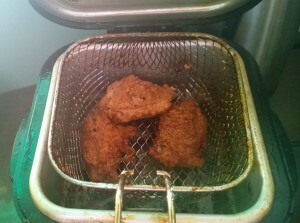 My dinky little deep fryer could only fit three pieces in at a time which is about the equivalent of one chicken thigh without a bone. Cook in batches, you can coat the next batch while the first is cooking. 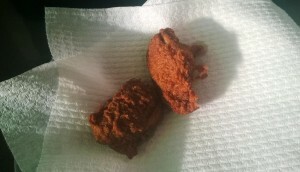 Given them about 7 minutes – they should go a deep brown colour, darker than the normal fried chicken but not as dark as beef jerky. Oi – what happened to the third one…… RICHARD ! Place on a rack or paper lined dish, put into a warm oven while frying the rest. When they are all done serve with caulitots, pumpkin or celeriac fries or something else yummy! 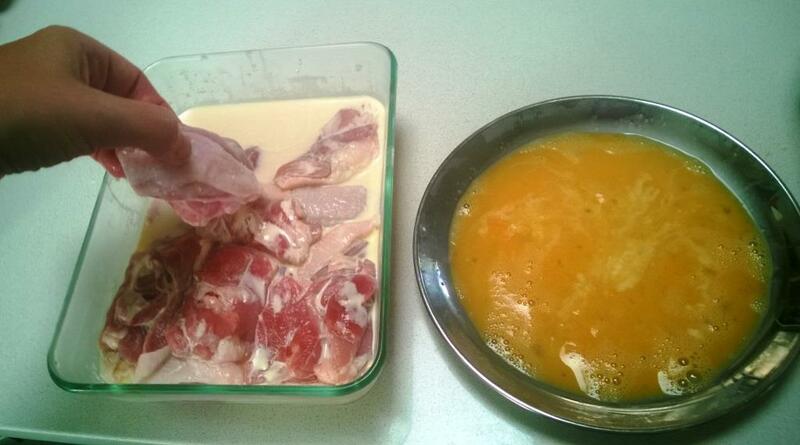 Cut the chicken up into required size pieces, add some salt and massage into the skin and flesh. Put the chicken pieces in a bowl and cover with buttermilk, milk or cream. Put in fridge for between 2 hours and 12 hours. Make up coating by adding the two flours, spices, salt, baking powder, splenda and black pepper in a dish and mix until thoroughly combined. Take the chicken out of the fridge to get to room temperature before cooking. If you are using chicken on the bone or whole breast/thigh then put the oven on at about 150c/300f as the frying will not cook the chicken the whole way through. If not, put it on low (100 or less) to keep chicken warm between batches. 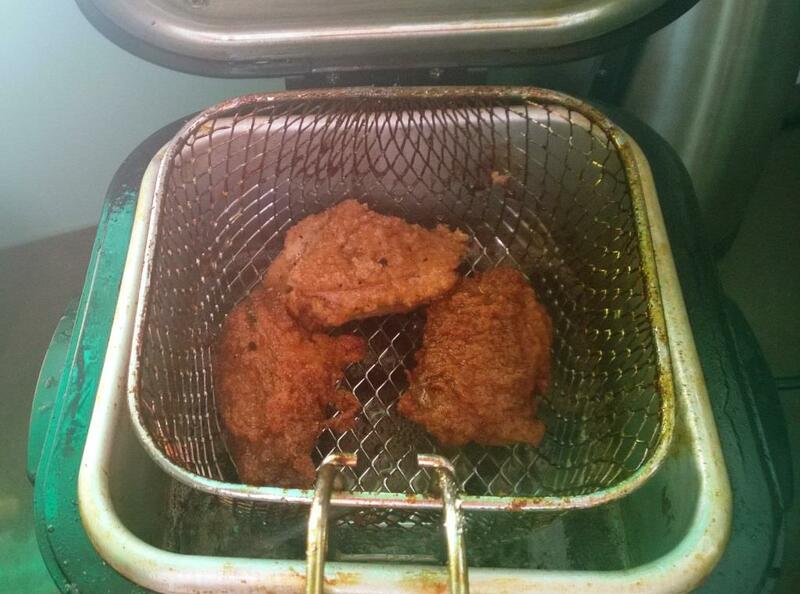 Fill the deep fryer with an animal fat (lard, tallow, or beef dripping) and turn to 175c or 350f. 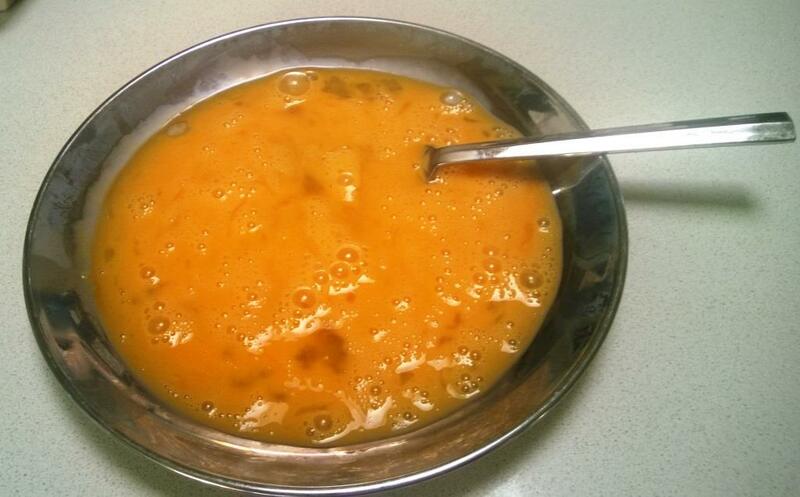 If you don't have a fryer, use a saucepan with at least two inches or 5cm of fat in it. Whisk the whole egg and put in a dish, then lift chicken from buttermilk and drain most of the liquid, dunk in the egg and make sure the entire piece is coated - you can do a few in the egg at a time. 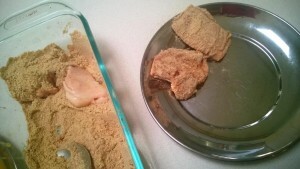 Next dunk the chicken in the coating mix and make sure the chicken is completely coated. Once the fat is to temperature, use tongs to put the chicken in the hot oil. Cook until the coating goes dark brown (about 7 minutes - but could be more). 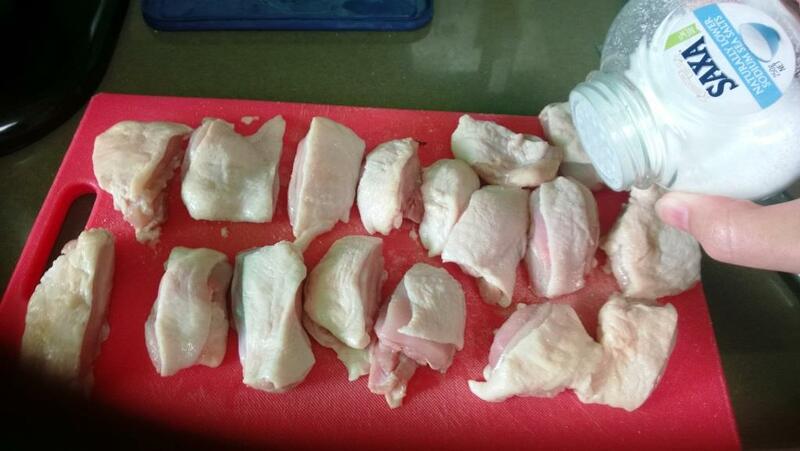 Remove from fat onto a rack or paper lined plate. Never over fill the fryer or pan, this just reduces the temperature in the fryer and can make the meat dry out, you want the outside to seal quickly and keep all the juices in the meat. 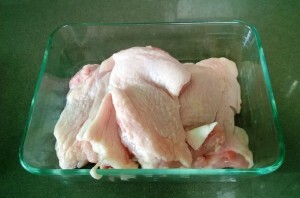 Place in warm oven while frying the rest of the chicken. If you are using larger pieces and need to cook for longer, fry all the chicken and then put into the oven so that the chicken cooks at a more even rate - cook for at least 10 minutes. This will keep cooked for a day in the fridge, if you are going to eat it more than 24 hours apart, keep the chicken in the buttermilk and seal in an airtight container, then fry fresh when needed.